As we sauntered the web in search of inspiration and interesting smartphone content, we discovered an awesome Reddit thread in which senior, battle-worn Android users reflected upon their first smartphones and how do they hold up from today's perspective. The conversation sparked a trip down nostalgia lane in us, too, for we happen to know each of these 10 Android relics intimately. Thus, we collected the Redditors' user opinions and juxtaposed them against the final impressions from PhoneArena reviews, just to emphasize the contrast between the then and now. Some of those barely usable handsets used to be true "hero phones" from a time in which HTC, Motorola, Samsung, and LG played their part in building the foundation for Android's massive success. We're kind of sad to see them go the route of disposable, dated electronics, but then again, mobile technology's headlong progress simply leaves no other option. Two years is already too long in the smartphone world, and six years is basically considered prehistoric! Enough ramblings. Enjoy the selection and have fun reading our reviews-turned-historical-accounts of these very special smartphones that came out guns blazing, but inevitably ended up aging like milk, rather than fine wine. "The HTC Wildfire S is a neat, compact smartphone. Naturally, with the small form-factor comes some loss in functionality, specifically applying to the usability of a virtual keyboard on its 3.2" screen. The other drawback comes in the form of the underpowered processor resulting in lag. On the flip-side, screen quality benefits from decent resolution, while Gingerbread with HTC Sense serves up a user-friendly treat." Obviously, you can't expect a lot of functionality in a smartphone with just 200MB of user-available storage. We also noted that software keyboards on 3.2-inch screens are a pain in the rear! Still, the Wildfire S was a solid smartphone at the time, and is worthy of some respect. Read the full PhoneArena review! "The EVO 4G offers just about anything the avid user could ask for, and it does it with style. In the meantime, it has a blazing fast data network to back it up. Android is coming into its own and we can now pronounce it a heavyweight mobile platform competitor." Ahh, it looks like enthusiasm got the best of us. What was a spectacular smartphone back in the day is now a bootlooping mess! Then again, the HTC Evo was built to make a statement, not to last forever. "Simple things like a video player, stereo Bluetooth and a 3.5mm headset jack are missing. Overall the phone performs well though, and it is merely the first step in what we foresee as the next true revolution in wireless." It looks like Inava remembers the HTC G1 just like we saw it – neither bad, nor great, but a crucial milestone towards the phenomenon that Android would become eventually. "We believe you already know what we are driving at – the HTC Desire is one of the best Android-based handsets today, but it's not perfect (not that there is such a device really). " In our defence, that 600MHz single-core CPU was a mighty big deal at the time of writing! Indeed, HTC made the most of the available technology and put together a pretty legendary smartphone. We're sure many of you have fond memories with it, and developers are still challenging themselves at porting recent Android builds to it. The Desire still gets the love it deserves, even if cannot hold a candle to today's Android flagships. "Is it the best Android device to date? Absolutely." It's perfectly normal that 2010's once-best Android device can't keep up with the demands of a smartphone user in 2016. Still, the HTC Nexus One was an example of the operating system in its early prime, and deserves its place in the Android hall of fame! "Our impression is that the HTC Desire Z is currently the best Android handset with a physical keyboard outside of the US." Just another old timey HTC hero phone that failed to hold up after six years or so. Does it come as any surprise at all? Also, does anyone miss those sliding keyboards? Good grief! "LG is serious about their Android push, and the Optimus S is a very nice device. Like the Mazda RX-8’s tiny 1.3L engine, the Optimus S does a lot with a little and delivers smooth, quick performance." Ah, well, that severely limited internal storage wasn't such a huge problem back then. Doing a lot with little was what the Optimus S was about, and it did deliver on that front. Oops, it looks like we never reviewed this one! Well, Samsung did have a few "sour apples" in the Android basked to go along with the mighty good Galaxy S smartphones at the time. "We found very few faults with the device – specifically the minor choppy movements when you navigate through the three home screen pages. Its improvements in the hardware department make it a worthy addition to the Android line-up that's becoming more robust." Ouch, those are some harsh words to throw towards Moto's Android veteran! But, just like everything else, the original Droid grew old and the time came for it to retire. This one did a lot to popularize Android as an alternative to Apple and BlackBerry's en vogue handsets, which is why we think the Droid is the kind of smartphone that deserves a proper viking burial! "The Motorola CITRUS is everything you expect of an entry-level phone. The materials are cheap, the display – poor, and performance - lack-luster. The lone bright spot for the CITRUS is the camera, but it is merely a decent performer, not anything spectacular." Once upon a time, we didn't have those perfectly fine $199 Android smartphones, and the lower spectrum of Google-powered handsets represented a pure, unadulterated mess. It's hardly a surprise that this afterthought of Motorola's is basically unusable today. Thankfully, Moto doesn't have many mishaps like this one its portfolio, lest they would have tarnished its reputation. Dec 04, 2015, 8:05 AM, by Luis D.
Aug 26, 2015, 10:54 AM, by Victor H.
Jun 21, 2015, 9:35 PM, by Florin T.
Dec 02, 2010, 9:06 PM, by Alan F.
Yes, I believe the Palm Pre, iPhone, and Nokia devices of the time certainly had a leg up in the competition when it came to design. It's just too bad that the only survivor was the iPhone. I thought the Palm Pre was a fantastic device and Nokia built some great stuff with Symbian OS. I'd normally agree with you... Smaller = Better... But these little 'critters' are way too small for my aging eyes... Barely bigger than my 2.6" Nokia C2-03 Slider... I've said this before, and shall say it again: 4.7" to 5.2" is the HOLY GRAIL of Smartphones Displays... Anything small is too small, and big is just too big... But feel free to disagree, as I'd respect that... G'Day! PA, you get that nexus one out of this list right now! I loved that phone! Yup, thats the point some miss when it comes to iOS. Leave older iPhones on older OS versions and yeah they run great. Try to catch up with the world and their true colors show. This is why I say I appreciate the way Google does it with OS updates: all or nothing. The way MS and Apple do it....sometimes it best to just let old phones stay old. Wildfire S owner here. Love the phone to bits, but the internal memory really is an issue for the device, I just switched from it about an year ago, it ran CM11 with a Mount2SD or Data2SD script which slowed it down more than usual. It's funny how far things have gone since it was released. Anyone who saw the phone at the time commented on how "big" the phone was. I had a one year contract on the LG Revolution years ago and by the time the contract was up I was ready smash the phone and leave Android. Around that time I found the Nexus line and got the Galaxy Nexus. That phone kept me from leaving Android. I might take this list seriously if it was phones from 2013 or 3 years ago to be exact. Of course phones that are 5-8 years old aren't going to stand the test of time, they need to be replaced at that point. Agreed. I doubt there are phones from any platform that are 5 years old and still running great. Back when the HTC Evo 4G phone was released (2010), it was the best Android phone, period, no contest. Of course the phone would seem lousy now. All the phones, including the 3.5" (no 4G anywhere to be found) iPhone from that era would seem crappy by today's standard. I still have fond memories of that HTC phone. Sprint couldn't keep them in stock. It took months to get one lol. I can agree with this list. The Droid 1 was a nice phone in its time. But as Android started getting better it got left behind. Root n ROMs can help most of these phones, but functionality is lost for the ones that cant run a specific OS version. That hurt the Droid 1 alot. I think the last decent OS version for it is 2.3....and thats from a ROM. 2.2 for the last official version. Yup, I fired up the Droid 1 a week ago and despite it running a custom GB ROM the RAM and processor speed held it back from being fluid and the updated google apps really lagged. oCing the processor helped but RAM was still an issue. 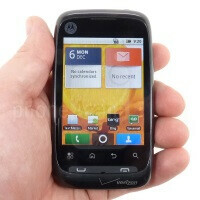 I also fired up the HTC Droid Incredible 1 and Motorola Droid X. Both actually performed quite well (both ran smooth wih GB) with the Droid X edging it even though both were running GB. Probably because I am so used to a larger display that the Droid X was easier to deal with. 6 of those 10 mobiles are made by HTC. Some hint there? is it any wonder or surprise that the majority of these devices are HTC products? I love the landscape slider keyboard on my Desire Z. It may be the best Android phone with a keyboard at the time, but that's not much of a compliment. Manufacturers always put keyboards on crappy phones. You never see a physical keyboard on a good phone. The Desire HD came out at the exact same time as the Desire Z. Compare specs between the two and you see why keyboard phones died off. They sucked compared to their non-keyboard counterparts. That LG Optimus S (T, V, One) was a great little phone. I wish one of today's flagships had such nice, clicky hardware buttons. Yea I miss this about the Droid X. For some time on screen, capacitive buttons were an issue because they didnt disappear and got hit by mistake too many times for me. Its better now. I still miss hard buttons. The Galaxy Ace needs to be there. Worst phone ever! iphone 4 maybe. Still runs like s**t compared to modern phones. You should do a followup article that mentions devices like the Droid X, Thunderbolt, and Captivate.